Members of the African National Congress (ANC) protest outside the party's headquarters in downtown Johannesburg, Feb. 5, 2018 calling for President Jacob Zuma to step down. South Africa's ruling party on Monday faced one of its biggest challenges since the end of white minority rule in 1994, struggling to resolve a leadership crisis amid increasing calls for scandal-tainted President Jacob Zuma to resign. Top leaders of the ruling African National Congress met Zuma at his Pretoria residence late Sunday for a discussion that one delegate had said would focus on the "best interests" of the party and the country. However, there was no announcement Monday about the results of the meeting, days ahead of a state of the nation address that Zuma is scheduled to deliver in parliament. South Africa's political opposition has said Zuma is a discredited figure who should not deliver the speech on Thursday, and that the occasion should be postponed until the ANC party sorts out its internal conflict. 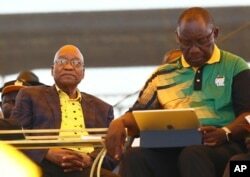 FILE - Newly-elected ruling African National Congress (ANC) party president, Cyril Ramaphosa, right, and former ANC president and South African President Jacob Zuma, left, attend the party's 106th birthday celebrations in East London, South Africa, Jan. 13, 2018. Many ruling party members want Deputy President Cyril Ramaphosa, who replaced Zuma as party president in December and has talked tough on corruption, to become state president as well so that the party can recover lost popularity ahead of 2019 elections. Critics of Zuma and supporters of the president scuffled outside party headquarters in Johannesburg on Monday. The ANC, which was the main anti-apartheid movement for decades, has led South Africa since the end of white minority rule and drew moral standing from its association with Nelson Mandela, the country's first black president. However, corruption scandals and mismanagement have sapped some support in recent years. The two dozen members of the ruling party's national working committee were scheduled to meet Monday afternoon to discuss Zuma's fate, South African media reported. Zuma still commands a loyalist faction, including in his home province of KwaZulu-Natal, and two of the six ANC leaders who met him on Sunday have publicly backed him. However, many former supporters have abandoned him and commentators believe enough ruling party members might join the opposition to oust him in a parliamentary motion of no confidence scheduled on Feb. 22. Ruling party leaders are uncomfortable with the idea of backing an opposition-sponsored vote against Zuma in parliament, fueling speculation that the ANC will make an internal decision to remove him in the same way that President Thabo Mbeki was ousted in 2008 with less than a year left in his second term. Critics questioned the legality of Mbeki's removal; the South African constitution only says parliament can remove the president through impeachment or a motion of no confidence. Zuma has been embroiled in scandals, including multi-million-dollar upgrades to his private home with state money and his association with the Guptas, a business family accused of looting state enterprises and influencing Cabinet ministers for their own benefit. Zuma and the Guptas deny any wrongdoing, though the president paid back some money for the home upgrades after the Constitutional Court ruled against him. In a separate case, Zuma's lawyers last week submitted arguments to prosecutors about why he shouldn't be prosecuted for corruption charges tied to an arms deal two decades ago. The charges had been thrown out but a court reinstated them last year.